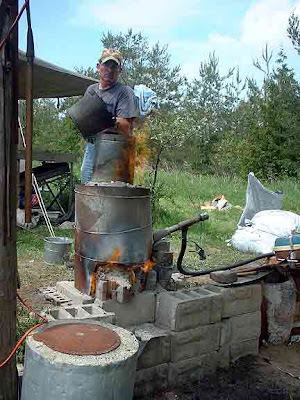 Continuing Adventures in Early Iron Production - An overview of experimental iron smelts, 2001 - 2008, by Darrell Markewitz. Bloomery iron furnaces of the Viking Age, experimental archaeology in iron production using direct reduction furnaces. The creation of a forgeable iron bloom from raw ores is the result of a series of individual tasks, requiring many complex factors to be correctly integrated. An examination of the archaeological remains provides only a glimpse of the final stages of what is an ever changing process that unfolds over several hours. So just how was iron smelted during the Viking Age? Through a process of experimental archaeology, it may prove possible to work backwards from successful physical methods towards a process which employs only elements consistent with the technologies available historically. Working primarily with a team from Central Ontario, Canada, the author has to date undertaken 39 individual smelt sequences based on Viking Age prototypes. What has been learned from practical experience at the furnace may prove informative to researchers attempting to understand physical remains in the field. Note: This paper has been revised from the original submitted in March of 2006, which only covered the first 13 experiments (to early 2006). What is seen here is the 'long version', before a further 2,000 words had been trimmed for submission for publication and with extra linked materials linked via the web. Those interested in seeing the original (2006) paper can find it as Adventures in Early Iron Production. In June of 2001, Parks Canada assembled a small team at LAnse aux Meadows, National Historic Site of Canada, Newfoundland. The intent for the week long project was to develop the interpretive methods to be used in presenting a new reconstruction of House-site J, described as the Smithy by A. Stine Ingstad / Eldjarn (1). The main feature of this structure was the fragmentary remains of what was interpreted as an iron smelting furnace. 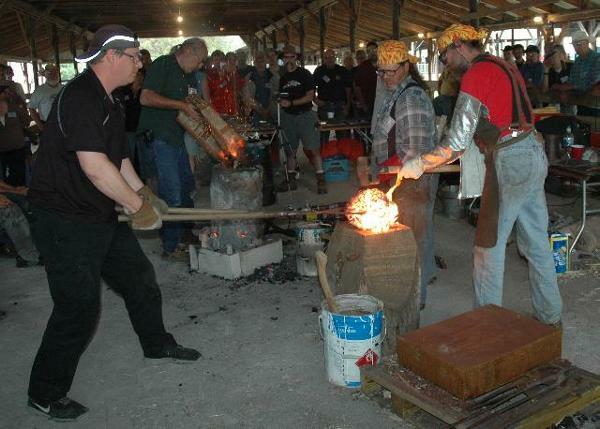 Part of the workshop was the construction and firing of a simple smelter, which served to initiate this experimental series. From that date to the end of 2008, a total of 39 individual smelt experiments have been undertaken, with a similar number observed. The first objective has been to establish a consistent physical method that allows for predictable production of workable iron blooms. As the series progresses, modern elements are being replaced with more historically accurate ones, based on the archaeology of the Viking Age. The intent has been to gain practical experience in the overall process, leading eventually to a full reconstruction of a method that might have been used in Northern Europe during the Early Medieval period. Specifics of furnace construction, air systems and raw materials will be discussed below. The pioneering work of Lee Sauder & Skip Williams (2) has established many of the basic principles and working methods upon which the details under consideration here are based. There has been found to be a clear relationship between smelter size and layout, the ore type and particle size, and the charcoal particle size. For this web based version of the report, this table with links to the field reports covering individual experiments was prepared. In almost all cases, the raw ores were roasted as the first step in their preparation. This converts the various possible iron oxides into the magnetic form Fe2O3 . A number of methods have been used to roast the various ores, primarily based on ease of handling, and these are discussed with each ore type. It has been found that the types of smelters and methods used in this series require an ore with a minimum of roughly 60 % Fe2O3 / 40 % Fe content to yield effective results. Regardless of the type of ore used, the ideal particle size for the scale of smelters used in this series has been found to range from pea to rice size, retaining any dust produced in the crushing process. This gives a size of 10 to 2 mm for the bulk of the ore added to the smelter, sorted by eye. Because of problems accessing a dependable source of suitable iron ore, a wide range of types and qualities of ore have been used over the series. For that reason, more experience has been gained with multiple ore types than is typical for most experimenters. * The St Lunaire material also included some Fe0 which is added to the total of Fe. - is a product of the chain of iron rich bedrock, leached by tannic acid bog water then deposited via the action of bacteria along the margins of small streams immediately below the source bog. Because of their small particle size (roughly 5-10 mm), these bog ores were heated to a dull orange (roughly 750 degrees C) on an open pan inside a propane gas forge then air cooled. A number of different clay bodies have been used for smelter construction . Starting with Smelt 12, it was realized that the low cost of powdered potters clays more than offset the huge labour required in preparing free natural clays. For that reason commercial ball clays have been used to construct the clay cobb smelters used for the bulk of the series. Early smelters constructed of solid clay generally proved less durable and more susceptible to wall erosion, the melting temperatures of the individual clays always being well below the internal working temperature of the smelter. There were so many advantages to clay cobb construction, use of straight clay walls was abandoned. In most cases, the Short Shaft furnaces have been constructed of the selected clay mixed with chopped straw to produce cobb. Local straw from cereal grains (baled for animal bedding) was chopped with a hand axe to a rough length of 7.5 cm. There was a certain randomness to this process, resulting in individual shaft lengths ranging generally from 5 to 10 cm long. Because the source material had been gathered from the field as an agricultural process, the individual pieces varied considerably in diameter, and included both plant stocks and leaves. The normal mix was about equal volumes of wet clay and chopped straw. Additional water was added as required to permit mixing by hand. A small amount of course beach sand (dug locally) was added as required to stiffen the mix. For the furnace used for both experiments 10 & 13, sphagnum moss was used as the binder. This was done primarily to test another possible material that would have been available throughout Northern Europe. Generally the moss proved not as effective as the straw. It absorbed a considerable amount of water during the mixing, increasing the drying time required at the preheat phase. It also did not give as great a structural strength to the finished smelter. The loose sphagnum proved much more difficult to acquire and was quite expensive. The cylindrical bodies of the furnaces have been built both free form and also by packing the prepared clay mixture between sheet metal forms. This second method greatly speeds construction, and also allows for creation of a very standard size and shape of test smelter. An internal bundle of wood slats (Smelts 15, 16) or sticks and straw (Smelt 18) has also been used to replicate a more historically based method of framing. Each individual smelt consumes anything from 50 to 100 kg of prepared charcoal. Most of these experiments have used various commercially produced charcoals, primarily oak or hickory. Generally it has been seen that the most significant factor between different sources has been how dry the charcoal is, the drier the fuel, the more efficient the burning. For experiments 1 & 2, charcoal was used straight from the bag with no attempt to grade for size. Starting with experiment 3 to 6, charcoal was sized into roughly 2.5 cm pieces by use of a combination of cutting with a hand axe and smashing with wooden mallets. Dust and fines were screened out by straining through a roughly 1.2 cm grid. These fines are set aside for use as base packing and a surface for trapping any tap slag. 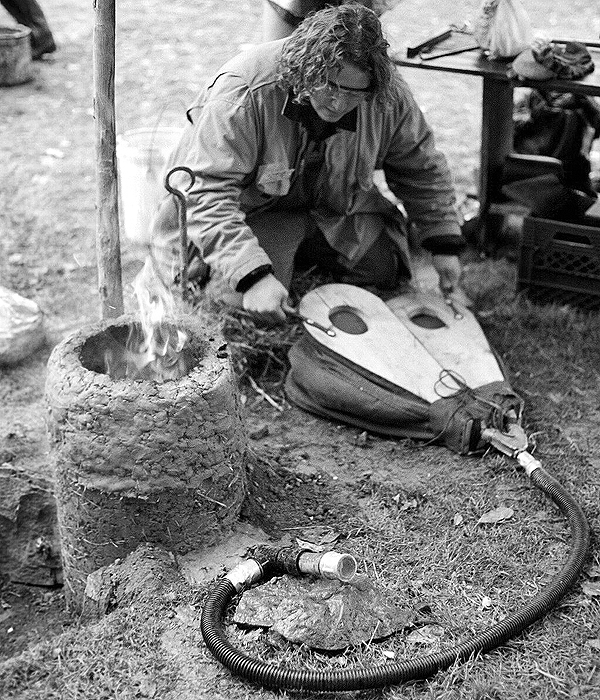 Because of the time involved in preparing the volume of charcoal required for an individual smelt, a heavy metal frame was created and used starting with experiment 7 . The charcoal is broken and sized by pounding through a 2.5 cm grid with wooden mallets. Fines are sorted out by a lower diagonal grid with about 1 cm spacing, and retained for packing furnace bases, etc. Although there have been a number of smelter classifications suggested (Cleere - 1972, Tylecote - 1987, Pleiner - 2000) , archaeology rarely preserves the upper portions of ancient smelters. An alternate set of terminology is used here, referring to size , construction details, and air supply system used. For the first two smelts, the overall form of the smelter was based on what was understood to have been used at LAnse aux Meadows circa 1000 AD. The details were supplied by Dr Birgitta Wallace (9), in turn based on her understanding of the archaeological remains at that site. What was suggested was a square box composed of local stone slabs, roughly 40 x 30 cm at the base, and about 40 cm tall, with the corners sealed with clay. The experimental furnaces of this type have used randomly selected gneiss slabs, chosen primarily for the shape of the individual pieces and ease of collection. As the first two experiments, these smelts should be really considered tests of establishing an experimental technique and possible equipment types. Latter experience would show that almost every mistake in furnace layout and smelting process possible had been made! Much later (Smelt 27) a modified version utilizing higher shaft walls (to + 60 cm) would prove effective. Future experiments are planned working towards a possible LAnse aux Meadows model. To date, these extra descriptive terms have been applied to the Short Shaft type, indicating extra features of construction. The initial experiments in this series started with the use of hand powered re-creations of Viking Age type bellows. After repeated failures, It was decided to utilize more dependable (and less labour intensive!) electrically powered blowers. Generally there has been an attempt made to stick to standard pieces of equipment. A number of mechanical air delivery systems have been utilized for portions of individual smelts (often for the simple reason of equipment failure while a smelt was underway!). Experience has shown that centrifical blowers intended as blacksmiths forge blowers (either hand or electrically driven) do not function effectively as smelter air supply. Such units may produce large volumes of air, but there is so little pressure produced that the air simply does not enter the furnace against the construction of the tuyere and the charcoal filled shaft. Air volumes reported here have been calculated from flow speeds recorded by a vane type anemometer. After Smelt 29, these measurements were made in line and so represent the actual air flow into the smelter body. 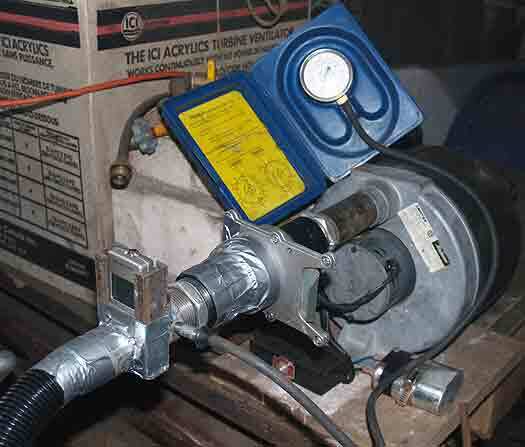 For the bulk of this series, the air supply has been attached to the tuyere via a length of flexible hose, attached to a T shaped fitting (seen in foreground - Figure 3 ) . This assembly is constructed from standard 1 1/4 inch OD galvanized pipe fittings, allowing for ease of modification as required. A T connector is set so the inlet air is supplied at 90 degrees to the tuyere. An end cap with a clear viewing plate is fitted opposite the tuyere allowing for direct viewing of the smelter interior down the tuyere. The viewing port can be unscrewed, allowing for any blockages to the tuyere to be cleared with a long steel rod (a process that has come to be known as rodgering). The exact amount of air supplied to the tuyere is controlled by a sliding blast gate set just downstream of the blower. This connection system was adapted from that used by Sauder and Williams. The two earliest smelts, and the three Viking Age presentation smelts (10,11,13 ) did not use this system. In these cases, the outlet of the bellows used was attached directly to the tuyere via a cylinder of leather. This creates a flexible coupling, preventing any motion from working the bellows from affecting the tuyere itself. The shape of the very earliest experiments was guided by a desire to emulate historic Norse forms. One of the primary features was thus the use of a reconstructed Norse Double Bag bellows system, a piece of blacksmiths equipment. Unfortunately the artifact evidence for these bellows is almost nonexistent; there are no surviving physical remains and there are only two known period illustrations. 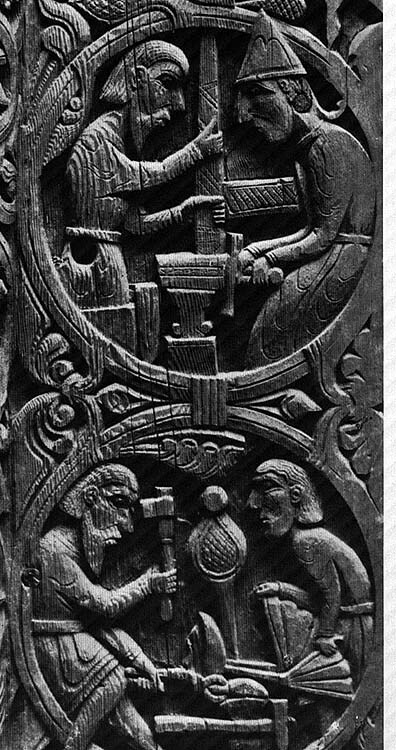 One from the Urnes Stave Church at Hylestad Norway, (late 1100s) is a side view, shown in relation to a human operator. The second is top view, from a rune stone carving at Ramsund, Sweden. From 1998 through 2008, a number of trial version bellows were constructed based on measurements estimated from these illustrations. The rough size of the reconstruction is 70 cm long by 50 cm wide overall. Each of the main chambers is about 50 cm long by 25 cm wide, in comfortable use providing a loft of about 30 cm. Each air inlet is 10 cm in diameter,with the outlet being a simple Y tube with roughly 2 cm interior diameter. Average air delivery is about 2.2 litres per stroke. In use, it was found that the average operator can maintain an effective pump rate of roughly one stroke per second, creating an air volume to the smelter of approximately 130 litres per minute. Figure 3 - The Norse Double Bag Bellows in action (Smelt 5). A super sized version of the double bag bellows was created for public demonstrations undertaken in 2005 & 2006. This unit, christened the Uber Bellows had individual bags with a length of 100 cm, and a width of 20 cm, with a typical loft of about 50 cm for each stroke. A rate of roughly 8 to 10 strokes per minute could be maintained, but with considerable operator fatigue. The delivery volume was estimated at an effective maximum of 90 litres per stroke, thus potentially 900 litres per minute. A general survey of Northern European archaeological finds related to smelting and casting suggested that the most common interior diameter for tuyere tubes of all types was about 2.5 cm. For this reason, all the tuyeres used have been selected for this size, regardless of the material from which they are constructed. The standard arrangement has been to use an insert style tuyere, typically standing 5 cm proud of the interior furnace wall. In the latest experiments covered by this report, work has begun to accumulate practical experience with the combination of bellows plate and blow hole. 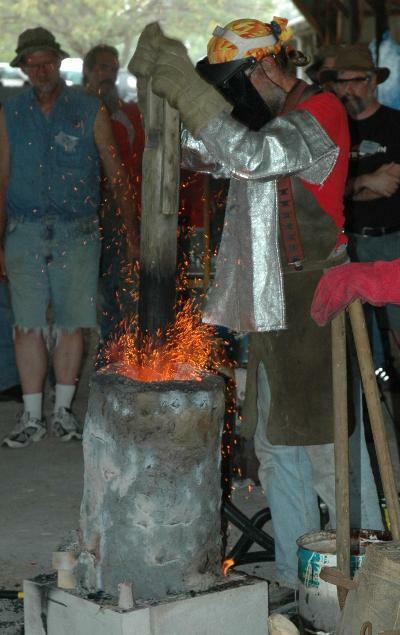 This method was introduced via Skip Williams (12) based on his experiences at The 3rd International Symposium on Early Iron, Eindhoven, Holland, 2007. Further observations of Michael Nissens use of the technique were made at The Iron Seminar at Thy, Heltborg, Denmark, 2008. Reduced to its simplest terms, hot C0 gas moves upward from the area of the tuyere inside the furnace. Ore particles are reduced as they fall down reducing to metallic iron and leaving CO2 to be expelled. The hot iron particles sinter, falling to rest just below the tuyere on top of the semi congealed slag bowl, and protected from the oxygen of the air blast by a pool of liquid slag. The first goal of this series has been to establish an smelter design and working sequence that consistently will efficiently produce good working quality iron blooms. Ore type and iron content then remain the single largest variables. The ideal is a dense, plano-convex, roughly oval mass of low carbon iron. Using a 60 % Fe / 85 % Fe2O3 ore, the expected yields have been in the range of 25 - 30 %. Without enough stack height above the tuyere, there is not enough of a reaction column to allow for the required chemistry to take place. For the standard sizes and volumes described, it has been found that the minimum effective furnace height above the tuyere is 40 cm. After the first initial failures, and for most of the experiments, setting an ideal base inside the smelter was considered of great importance. This was done by placing a layer of charcoal fines in the bottom of the furnace, of a depth so to leave approximately 15 cm clear below the tuyere. Although proven to be effective in establishing the location of the slag bowl, and making bottom extraction of the bloom much easier, this method is certainly not indicated by archaeological remains. Starting with Smelt 22, most of the furnaces have a natural base composed of wood ash and partially burned charcoal from the preheat step. Despite earlier concerns, it has been seen that creating a specific base level is not necessary to an effective smelt. 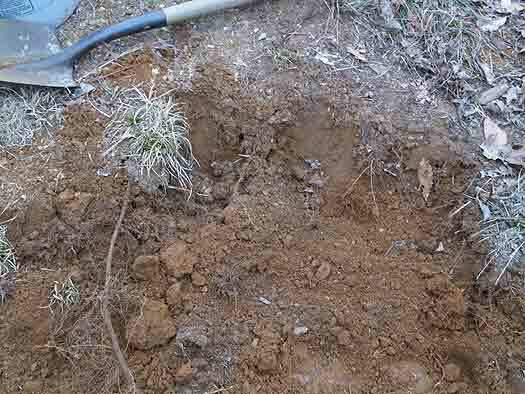 It has also been found that there is virtually no heat penetration below this ash layer to the soil underneath. It has been demonstrated by Sauder and Williams (13) that in fact a successful smelt is most likely when high volumes of air are supplied. They have suggested that an ideal rate of 1.2 to 1.5 litres per minute for each cubic centimeter of the smelter base cross section. The experiments described here also support this conclusion. For the smelter size that has come to be standard for this experiment series (average between 25 to 30 cm diameter) this translates to effective air rates in a range between 560 to 1060 litres per minute. Of course any reaction is also dependent on time. For these furnaces, burn rate is always closely monitored, being the time to consume a standard charcoal measure. Typically this is about 2 kg (or about 10 litres), the ideal consumption rate found to be one such measure every 8-10 minutes. For most smelts a working range of between 6 - 12 minutes is allowed before any modifications need to be considered. During the workshop session with Sauder, Williams and McCarthy in February of 2005, a set of test smelts determined that the angle of the tuyere has a pronounced effect on the formation of the bloom. 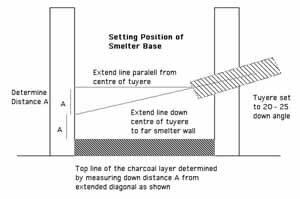 At least for smelters in the size range under discussion here, it has been found that the most effective tuyere angle was from 20 to 23 degrees down from horizontal. At angles below -15 degrees, typically the slag bowl forms too high, not leaving much room for the developing bloom and the shallow slag bath drowns the tuyere. At angles much higher than -25 degrees, the blast from the tuyere effectively cuts away into the bloom. 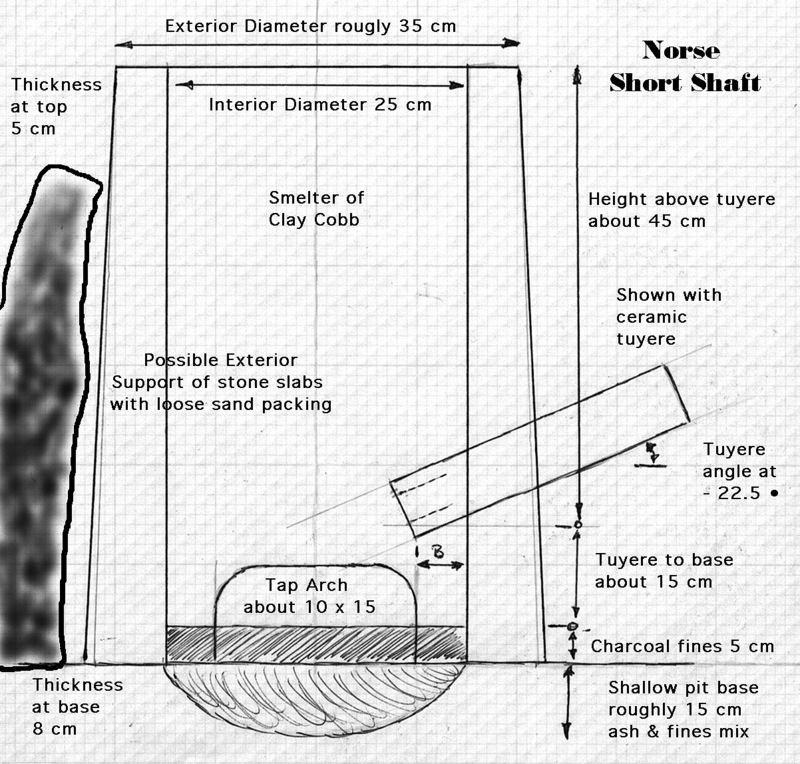 Position of the tuyere tip related to the smelter wall, and the durability of the tuyere allowing it to maintain that position, has also been discovered to be of importance. Again for smelters of this size range, inserting the tuyere so it extends 5 cm beyond the inner wall has been found to be ideal. As the tuyere tip approaches the inner wall, excessive erosion of the smelter containment, especially just above the tuyere, is most likely to occur. Although direct experience with the bellows plate and blow hole combination is limited at time of writing (only five smelts) the results have consistently been smaller, crescent shaped and more sponge like blooms - rather than the dense pucks created with using insert tuyeres. This is attributed primarily less penetration of the air blast into the furnace body, changing the dynamics of the effective heat zone. Consumption rate can also be controlled by varying the amount of ore added. The ore charge is distributed evenly through the addition each charcoal bucket, not applied as a thick layer as is often illustrated. The charge is sprinkled over the smelter mouth, exact location varies with the burn pattern visible in the charcoal. With charcoal being consumed at the desired rate, any given particle of ore is inside the reactive gas column for about 30 - 40 minutes. The size of peak ore charges have varied between individual smelts, but commonly reach 2 kg ore to each 2 kg of charcoal, added every 8 minutes. Across this series, it has been found that there is a bottom threshold on the amount of ore required to create the interior environment that leads to bloom formation. Although the silica content of the ore is certainly a factor, about 8 kg of ore has been required for smelters of this type to form the slag bowl and start the growth of a solid bloom. The various reconstructions of a Viking Age double bag bellows produced simply do not produce air volumes large enough to successfully produce a large and dense iron bloom. The experience of many experimenters is that a low air volume smelt will result in small sized and lacy or bubbly blooms, which in turn are extremely difficult to consolidate into useful iron bars. This contrasts quite sharply with the quality of known artifact blooms. Overall this suggests that the single Norse Double Bag bellows, as directly based on the historical evidence, was a tool primarily intended for the blacksmiths forge - not the iron smelter. Now, a number of the smaller blacksmith units, linked via an animal skin bladder, could certainly provide the air volumes required. With the addition of a simple inlet-only valve at each attachment point, plus the use of a plank with a stone weight, a constant air flow to the tuyere would be created. This system will average out variations from individual operators, plus gives a constant flow, rather than the pulsing air delivery created from the action of a single unit. Modifying delivery pressure could be accomplished by changing the stone weight. This will shift the location of the hot spot inside the smelter which, in turn, could affect the size and shape of the developing bloom in a positive manner. By extension, this system suggests a different social organization surrounding certain types of smelting operations. Like house raising, ship building and other high labour projects, these smelts might have gathered together a number of local households, perhaps then moving in rotation among them. Those researchers knowledgeable in social structure or rural lifestyles are certainly encouraged to examine this possibility. Perhaps the simplest conclusion is that a bellows intended for iron smelting use was simply larger, and that samples of this type have yet to be uncovered. Ongoing tests in this area have suggested that increasing the single bag measurements to 30 cm wide and 65 cm long will provide dependable air volumes in the range of 750 litres per minute. Careful examination of known smelting sites for the void patterns in debris that would be caused underneath working bellows may provide valuable insights. There are two ways normally used to extract a final bloom from the smelter. Each presents different advantages and problems for the iron master. The two methods also present different physical remains which may prove indicators to archaeologists. Observations of debris from single event smelts have even shown clear voids indicating location of the workers. Front extraction is best suited to large sized blooms, and requires smelters either set totally above ground level or having quite large pits in front of the structure. One other advantage to this method is that the workers are able to shield themselves from much of the intense heat of the smelter interior by keeping their bodies to either side of the smelter as its base is opened, working with long handled tools at full arms reach as much as possible. This method requires either greatly enlarging the size of the tap arch, or digging away underneath the base of the smelter - often both. Typically there is considerable damage to the lower front of the smelter, especially when removing a large bloom. When the furnace is opened at the bottom front, any burning charcoal and loose slag fragments are raked away from the inside of the smelter below the slag mass. When the smelter is set above ground, this hot debris is raked forward of the smelter, and then shoved off to either side out of way of the workers. Next, the front portion of the slag bowl is chiseled off to expose the bloom, which also will drain any remaining liquid slag (forming sheets). This action tends to break much of the slag bowl, still yellow hot, into large lumps. These are in turn pulled out and tossed to the sides, or away from the working area entirely. Next the hot bloom itself is pulled out of the smelter, using a hooked iron bar or special large bloom tongs. As this is done, the burning charcoal remaining above the bloom is pulled free, and tends to fall down to the bottom of the smelter and spray outward from the opening. After extraction, much of the slag bowl is likely to remain in place inside the furnace, leaving a distinctive, roughly C shaped mass. If the furnace is to be reused, it has certainly proven easier to break up and pull away this mass while it still is hot. The other possible method is withdrawing the mass out of the top of the smelter. This method is ideal for smaller sized blooms, which has been the objective of most of these experiments. Its main disadvantage is in the extreme heat faced by the individual who physically uncovers and pulls out the bloom from the incandescent interior of the smelter! The entire process must be undertaken with a reduced air blast through the tuyere which keeps the liquid slag pool from freezing and locking the bloom solidly in place. A smelter intended for the top extraction method needs only a small tap arch, used for decanting liquid slag as required during the firing. A small tap arch adds to the stability of the structure, and requires less patching if reusing the smelter.In this method, a long handled metal scoop is used to scoop out all the remaining burning charcoal from inside the smelter, until the top of the molten slag pool covering the bloom is exposed. Assuming a right hand operator, this charcoal is typically dumped in a distinctive pattern the rear of the smelter (away from the tuyere and the bellows operator). 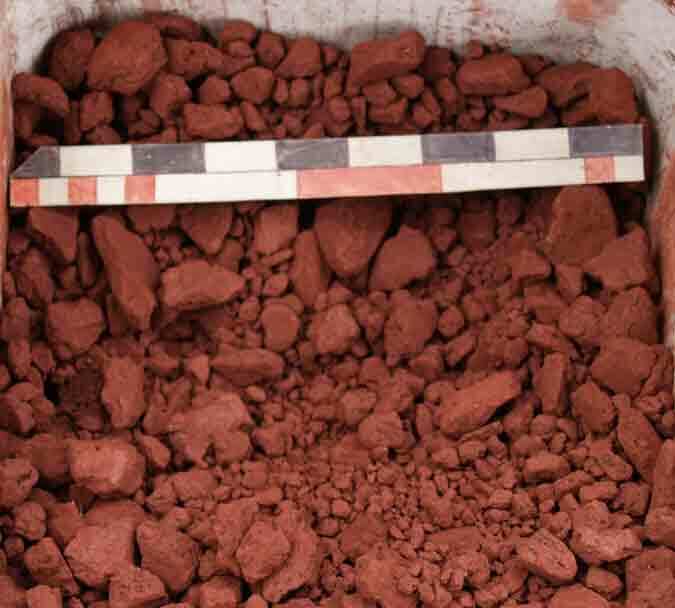 This material may also contain lumps of partially reduced and loosely sintered ore which had not incorporated into the bloom (from the last ore charge added.). 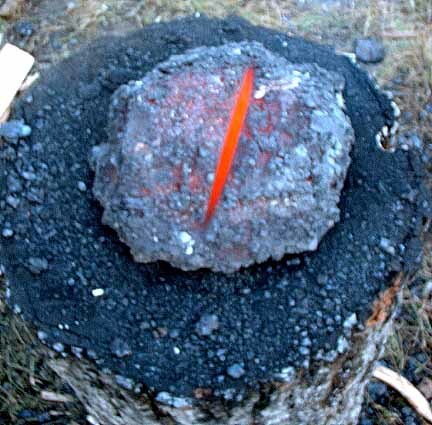 In many of the experiments, some liquid slag itself was scooped out at the end of this sequence, resulting in a spray of molten iron rich slag droplets deposited on top of this charcoal. 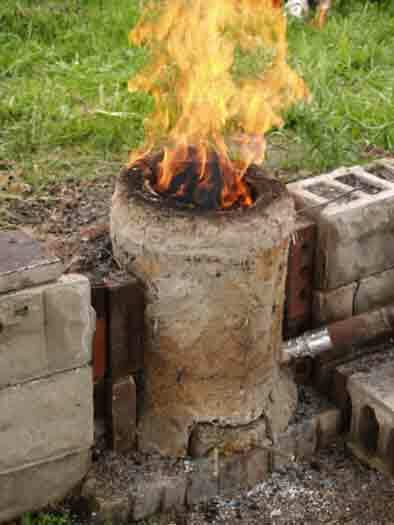 Figure 6 - Scooping burning charcoal before extracting the bloom from the top. The next part of the process is to use a log thumper to strike the top of the bloom in place, a method adapted from that used by Boonstra, van de Manakker & van Dijk (14). As the bloom forms just below the tuyere, special care must be taken not to strike the tuyere itself. This process has several effects on the bloom. First, as the bloom is just at welding heat, striking it serves to compress much of the lacy mother material into the mass - with less loss than when the bloom is extracted before any hammering. Hammering in place also serves to loosen the metallic bloom from the semi-congealed slag bowl underneath it. Next a bloom hook is forced down and underneath the edges of the bloom to pry the mass up and free from the slag bowl. Once loose, large bloom tongs can be used to grab the metal mass and pull it up out of its position in the slag bowl - and free of the smelter. If the air flow was cut at this point, the slag bowl, virtually intact, would freeze in place inside the smelter as one piece. It would display the well known clyndrical shape with concave upper surface. The top surface would have some charcoal deeply embedded around the edges as a result of the pounding from above. The lower surface would have more the appearance of tendrils running down and around charcoal lumps. One other huge advantage of extraction from the top is that there is very little damage , if any, to the structure of the smelter. If the process of extraction is preformed quickly enough, it is quite possible to fill the smelter with fresh charcoal, and with increased air blast quickly restart the fire. 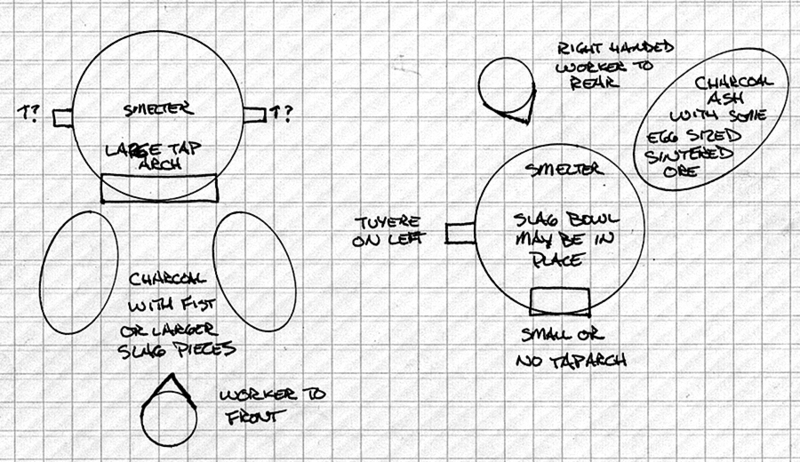 This allows for use of the smelter as a giant forge for further work on the bloom. 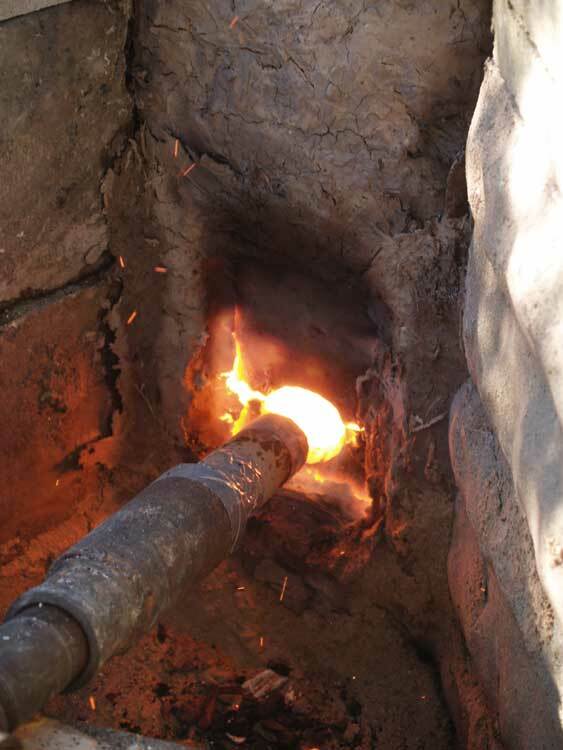 More importantly, as the smelter is not significantly damaged by this method, and retains the bulk of its internal temperature, it should be posible to immediately restart a second smelt, the main limitation would be the volume of slag already in position just below the tuyere. A typical dense bloom will range from a rough football to lens shape as it is removed from the smelter. Normal practice has been to quickly hammer the mass, still with considerable lacy iron material and slag attached, on a green hardwood stub. Originally suggested by M. McCarthy, such a stub is set to a classic blacksmithing height (roughly 60 - 70 cm. ), and should be at least double the diameter of the blooms being worked, perhaps 40 to 60 cm. Ideally it would also be dug into the ground slightly to keep it stable, and as such may represent an archaeologically identifiable feature. The surface of the bloom is worked over with sledge hammers, first to remove any slag still clinging to the surface, which can be easily distinguished from the solid bloom underneath by both a different texture and the faster rate at which it cools. At the same time, an attempt is made to compress and weld in any of the lacy textured iron mother - sintered and reduced iron which has not securely attached into the main bloom mass. Depending on the consistency of the bloom, considerable liquid slag can often be seen being driven off the surface under the hammer blows. As the metallic bloom is often still at a welding heat, these remains should consist of a distinctive pattern of smelting slag mixed with large hammer scale. Hammer strikes typically spray materials more to either side than to front and rear. Any particles are further prevented from flying backward as they intersect with the hammer operator. If the fragments are heavy enough and occur in enough number, it has proved possible to estimate the number and position of this work team by looking for the pattern of voids caused by the bodies at work. Figure 7 - Likely debris fields around a smelter. Artifact iron blooms from the period of interest are often found as compressed pucks, in the range of 2 to 12 kg in weight. An average bloom is about 4 to 8 kg and often shows a distinctive slice from one edge. (15) The shape of these blooms has certainly derived from an initial consolidation immediately as they have been removed from the smelter. Experience from cutting a number of blooms (and through years at the forge) suggests that an iron master can judge both the density and rough carbon content of the metallic iron through the amount of effort required for these processes. The method as developed here has produced blooms as large as into the 20 kg range. As a rough rule of thumb, the first three hours (including preheat), and approximately 1/3 or more of the total charcoal expenditure, are used to reach the point in the smelter sequence where any bloom at all is starting to form. Obviously making a single large bloom is a far more efficient use of all resources than running two separate smelts to produce two separate half sized blooms. When this ability to produce large blooms utilizing smelters of similar size to artifact samples is demonstrated, it raised the question - why are so many of the artifact blooms so much smaller? The answer may lie not in the iron smelter itself, but with the Norse blacksmith. Examination of the existing artifact tool sets, although admittedly removed from the smelting operation, suggests that very large sledge hammers were not part of the Viking Age tool set. The largest hammer in the Mastermyr find is 3.4 kg (7 1/2 lbs), with the next pair (most certainly single hand hammers) at 1.8 and 1.6 kg. (16) The largest, fitted with a 85 cm handle (the longest that would fit in the chest) only compares with the smallest hammer used during these experiments for consolidation (at 8 lbs / 3.6 kg). Most of the hammers used for experimental consolidation were in the 10 - 15 lb (4.5 - 6.8 kg) range. Particularly when attempting to work a large, dense bloom, a lighter hammer simply cannot strike with enough force to affect the mass significantly. The second factor is related to the problem of physically heating such a large mass of metal. All the work being described here is undertaken as quickly as possible, utilizing the initial heat remaining from the smelting process. Once the bloom approaches a measurement close to that of the diameter of the smelter itself, even the still hot smelter cannot supply enough heat to raise that mass back up to effective forging temperatures. In this experimental series, the largest blooms (in the range of 10 - 20 kg) have not been worked into bars, exactly because of this same problem of how to reheat them. One conclusion is that historic blooms have been created in smaller sizes that what could have been easily achieved quite deliberately - specifically for ease in handling, forging and reheating. After smelt three, an attempt was made to outline the possible experimental variables that might influence the progress of a successful smelt (17), with dozens of individual factors suggested. At the time of writing, most of the major elements have at least been roughly determined : a working smelter design, a relationship for ore and charcoal particle size, and a determination of effective air volumes. The team has reached a level of experience where metallic blooms are predictably created. 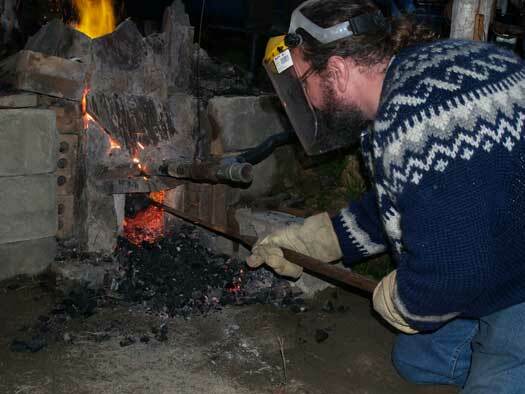 More work remains in effectively matching reconstructed Viking Age bellows types into the smelting process. More practice needs to be acquired in controlling the carbon content of individual blooms. Above all, it must be clearly stated that the progress of the experiments has started from a largely theoretical basis, then moved over to concentrate on a single effective system, and now is in the process of working back towards a possible historical model. The continuing problems with air delivery, and the frankly speculative solutions explored, certainly reminds all involved that these experiments may present a way to effectively smelt using Viking Age prototypes - but may not represent the way used historically. An important influence has been repeated workshops with Lee Sauder & Skip Williams of the Rockbridge Bloomery, Lexington VA. Along with Michael McCarthy, the resulting professional association and personal friendship has greatly influenced the experimental series discussed here. Many core ideas recorded here have sprung up at late night group discussions after a long day of smelting and every attempt has been made to attribute individual contributions if at all possible. Neil Peterson assisted in the preparation of this paper by editing the document. These and other members of the Dark Ages Re-creation Company have formed the core team for many of the experiments described here. It would have been impossible to mount the individual smelts without their willing labour. Individuals have also provided their skills in documenting each experiment and all have suggested improvements as the work has progressed. To Royal Oak Charcoal. Royal Oak has generously donated all the charcoal used for the bulk of these experiments. This continuing series would not have been possible without their support. (3) As analyzed by R. Hansen at Eramet, Prosgrunn in July 2001. Data received in a personal correspondence from A. Esplund, 25 July 2001. (4) As demonstrated by A. Espelund during the Parks Canada workshop, June 25-29, 2001. (5) As analyzed by M. Burham at Sudbury, Ontario in February 2002. Data received in a personal correspondance from M. Burham, 10 February 2002.